Niacin is on the most widely used ingredients to promote blood flow. This is a critical ingredient to achieving a pump deep within your muscles. 5% Nutrition 5150 keeps your focus on training and not an annoying itching feeling, so there is just the right amount of B-3 to help get you the pump you need. This ingredient is the “building block” of Acetyl Choline, which plays a very impactful role in brain function and muscle control. 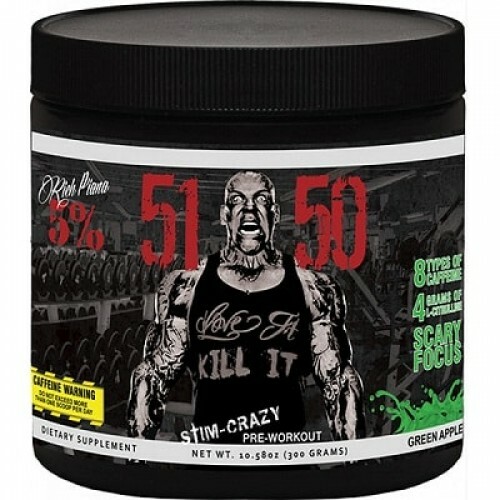 5% Nutrition 5150 delivers the mind-muscle connection benefits of Choline Bitartrate so you can have over the top concentration on working muscles that truly need undivided attention. You have seen this in almost every energy drink and pre workout out there, but why? Taurine works synergistically with caffeine to increase mental and endurance performance. A whopping 2 grams dose of Taurine will also help you increase your work capacity in the gym by making your body use fat better and by causing fast-twitch muscles to produce more peak force. You are only 1 scoop away from never going back to the same old pre workouts and the same old training. The weights never expected you to come into the gym like this before. Enter the gym and hear them clank and shiver in fear, cause there’s a 5% Nutrition 5150 on the loose and ready to dominate their workout! As a dietary supplement for adults, mix ONE serving of 5% Nutrition5150 pre workout with 6-8 ounces of water 20-30 minutes before training on an empty stomach. Do not exceed recommended servings. To avoid sleeplessness, do not take within 4 hours of bedtime.